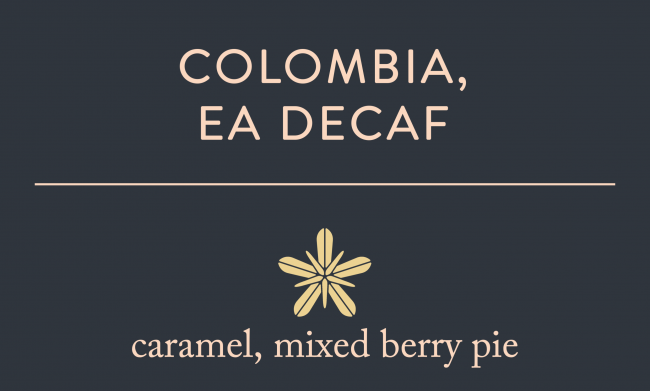 This coffee is almost certainly different from any other decaffeinated coffee you’ve tried. It is delicious and syrupy sweet, reminding us of taffy and possibly bananas. It is also bright, with a very clear citrus note. There is no doubt it could go head to head with many fine caffeinated coffees. Our decaf coffee comes to us again by way of Collaborative Coffee Source and the Acevedo region of Huila, Colombia. This blend is the result of many farmers hands, all excited to create specialty coffee. While this coffee isn’t from a particularly high elevation – 1,400 to 1,500 meters above sea level – their proximity to the jungle means the nights are very cool. Therefore, the coffee matures more slowly, cupping more like a coffee produced at 1,800 meters above sea level in Colombia. This coffee was decaffeinated at origin using the natural Sugar Cane Ethyl Acetate (EA) process. Ethyl Acetate, the solute used to dissolve caffeine during the process, is derived from fermenting Colombian grown sugar cane. After washing and steaming the beans to open their cell structure, they are washed in an ethyl acetate bath to extract the caffeine. After draining away the ethyl acetate and washing the beans a second time, they are dried back to the 11-12% moisture with which they started. This process does not remove the distinct and intricate flavors of the coffee. In fact, it is found to add sweetness! All orders are processed on Monday and shipped by Wednesday from our Cambridge shop.